Happy Sunday!! It's unreal how excited I am about the fact I am doing my June favs! I say this every month but how on earth are we half we through the year. My holiday and birthday are so close and I can't believe it. This month I only have gathered a few favourites. Number one, The Fab Pore moisturiser. I have been looking everywhere for a good moisturiser. I have really combination skin so i find it difficult to find one that didn't break me out and doesn't make me oily. I went for Soap and Glory again since they have done wonder to my skin. It absorbs quickly into my skin and makes my make-up apply nicely. It has Poreshrink -12h which is very gentle on my skin, Superfruit Yuzu which helps tones and brightens my skin, it has also helped with my break out. Another product I have loved for my skin is the Clearasil Rapid Action Scrub. I use this in the morning and after I take my make-up off. It makes my skin feel so soft and very clean. I love Clearasil products and just like Soap and Glory products they do amazing things to my skin. Having good exfoliated skin is key in the summer. Both on the face and on the body. 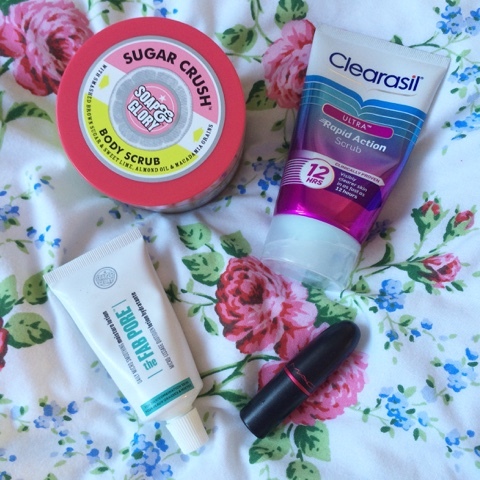 So my third fav is the Soap and Glory Sugar Crush Body Scrub. The smell is super summery and fresh. I seen it in Tanya burr latest video and had to try it. Having used Fake Tan this month I need a great body scrub/ exfoliater. This is perfect and is deffo a must have this summer. The fourth thing I have been loving is Miley Cyrus Viva Glam lipstick. I purchased this back in February when the collection came out. I wasn't sure whether I could pull of the bright colour but I absolutely love it. It is such a fun party colour. I absolutely adore the texture of this lipstick, it last for quite a long time and looks amazing. The last thing I HAVE to mention is TAYLOR SWIFT. Seeing her last Tuesday has made me love her 100x more (if that is possible). Her songs, performance, personality.. Aka everything is perfect. If you get a chance to see her live I woken highly recommend!!! If you want to see what I make-up I wore I did a blog post here. I will try to keep this blog updated as much as possible. I am hoping to blog when I am in America but it may only be once a week. Let me know your June favourites?